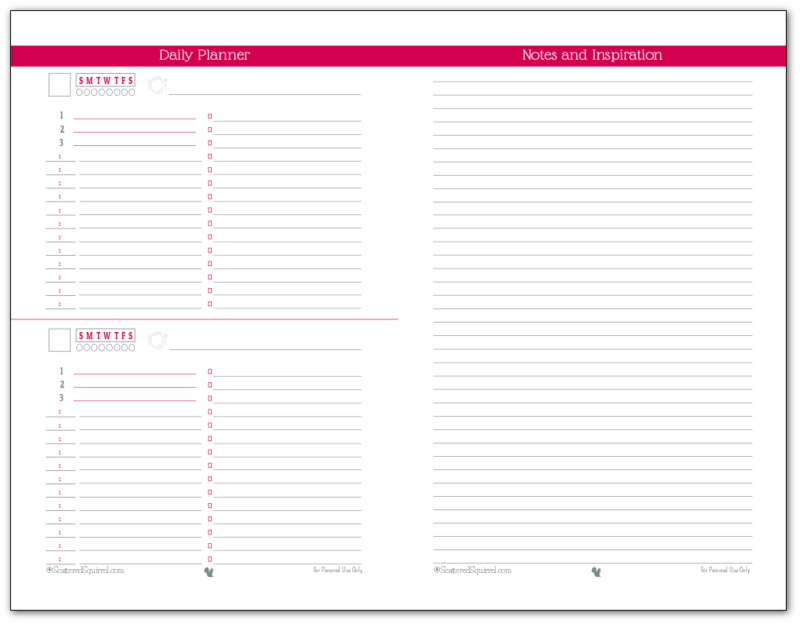 As promised yesterday, today I’m here to share the half-size versions of the new day planner printables for those of you who prefer a half-size planner. I’ve been using the full size version today and I have to say that I’m thoroughly enjoying it. Daily planners are a great way to keep track of what you need to do on really busy days, and these news ones are a great option for those who have too much going on to fit a weekly planner, but not enough to really benefit from a whole page dedicated to one day. So if you’ve been trying to find a good fit between the two, these ones might be a good option for you. Scroll on down to check them out. I explained how these came to be in yesterday’s post – New Day Planner Printables to Help You Plan Your Days – so I won’t repeat myself today. I know time is precious and some of the posts in this series have been fairly long, so I want to keep these one shorter. So, if you’re ready, here we go. I hmmed and hawed trying to decide how best to lay these out. In the end I opted for two different options, that way you have more to choose from. First up are the ones that reflect how I’m using the full size printables. You’ll see what I talked about yesterday when I said I was using the day planner on the left and the notes and inspiration pages on the right. It’s simple, and yet, as I’ve discovered today, it’s a great system. Right now, on the one I’m using I have my to-do list for getting ready for the holiday weekend (it’s Thanksgiving weekend here in Canada) in the list section for today, and my grocery list is in the list section for tomorrow. I’ve scheduled some stuff into the time slots, and I’m currently using the 1-2-3 list section for my daily three things that I’m focusing on for this challenge. Though, once the challenge is over I’ll start using for the three most important things I need to make sure get done each day. The notes side is already half full of ideas and things I don’t want to forget. I can see these notes sections being great for planning out my weeks. I know the above set up isn’t going to be for everyone. 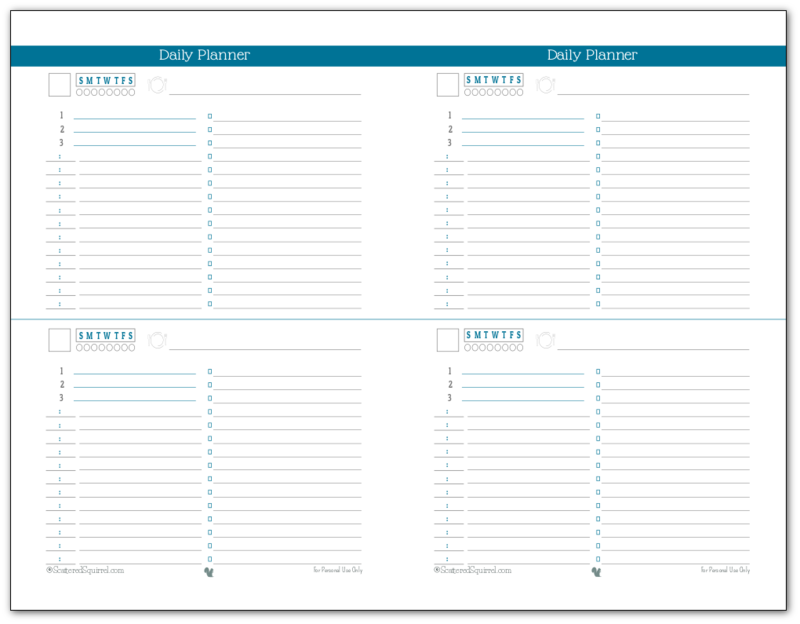 I’m sure there are plenty of people who would just like the day planner part, which is why the next set are just simple half-size day planner printables. I’d love to hear your thoughts. Do you think you’ll be able to make use of a day planner paired with a notes page? Do you prefer just the day planner? Or are you holding out for the new weekly planners? I hope you all are having a wonderful end of the week, and I hope you have an amazing weekend. Don’t forget to keep working away on your three things. I’ll be back tomorrow with another fun and slightly frivolous post. I think we’ve earned some fun don’t you? THESE ARE AWESOME!!! As a fellow 1/2 sheet’ er, I thank you for including this size!!!! My pleasure Lora! 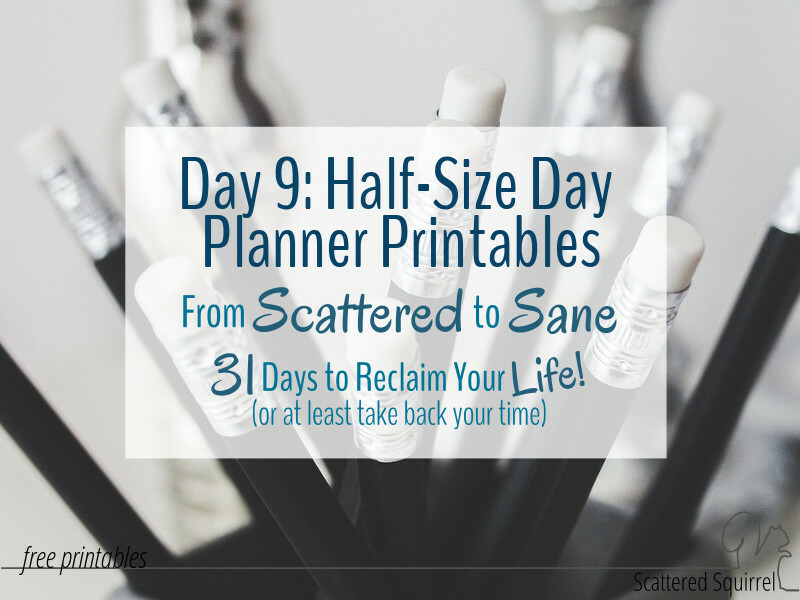 I miss using a half-size planner but I was finding it too small to keep track of work and personal. I love the 1/2 size planner sheets. I’m very glad that you have made these. I use a small note book and they are perfect . Thank you for all your hard work. I love these! I especially like the 2 days on 1 page. There is so much that gets deferred to Sat & Sun that this would work for that. If I don’t have things written down for the weekend, my brain goes somewhat blank when I’m trying to think of everything at once. One thing I don’t like about a lot of planners in general is the tiny space that’s given for the weekend. I really love these. However, I use a Filofax personal size planner. The half sheets are a little too big. Can you resize them for a personal size? Thanks. I would love, dearly love, to be able to size all the printables in different size. However, that takes a lot of work. I am toying with making some planner pages just for filofax users, maybe I’ll see if I can move those up my list and get them out before the new year. Until then, the best advice I can offer is to try printing them at 75%. I’ve heard from others that that will work in a pinch. Sorry I couldn’t be more help. Could you assist me in printing full size half size printable passsword sheets and contacts. I can try Sharlotte. Is there any particular error that comes up when you try to print? I am new to the whole diy planner thing. My biggest issues in the past is planners never came equipped in a way that worked for me. A few weeks ago I was playing around on YouTube with some art tutorials and came across different videos of diy planners- and wondered where have I been hiding that I didn’t know about this for the last few years?! I found more expensive kits to start with, and as money is tight for me right now, I can’t afford those. I found a basic notebook in the diy planner design at an office supply store that was half-off due to their stock rotation. (I had originally went in there looking for a pattern they put on sale that I thought was ok, but the plain ones were on sale half off. I paid £4 for it. And they also ran with the special a free accessory, so I got a page protector set for free with it! Score!! I bought a ruler and a pack of blank sheets for just over £2 for both, so the total investment on this is £6. For someone just starting, that is amazing. 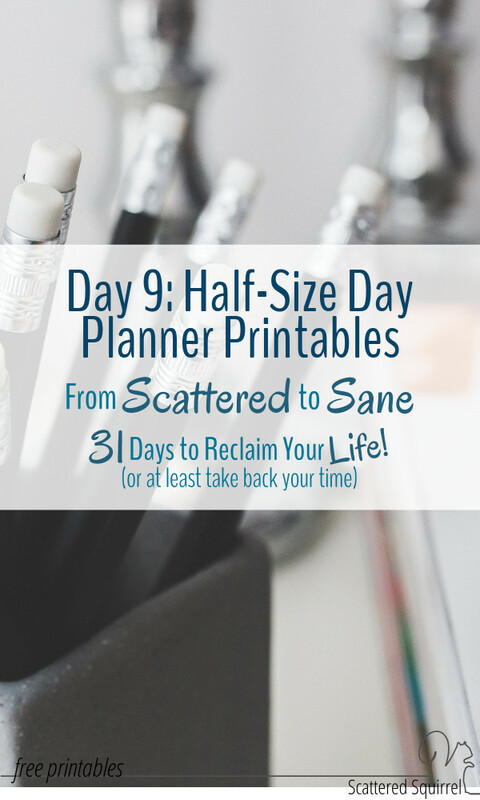 I came across your site for free printables looking for a calendar layout, and I fell in love with your half page layouts (which are the size of my new planner). Thank you for offering such wonderful designs! I thought I was going to have to sit there with a ruler and pens and make them, but I found a set of your I loved. I also perused your other printables and I have to say, I am impressed at how you have put lists together. It is something that has been sorely missing in the retail industry-I never find what I’m looking for, so I use notebooks which over time get messed up. You have found a way to make pertinent layouts which are perfect. Awesome job, and thank you! !